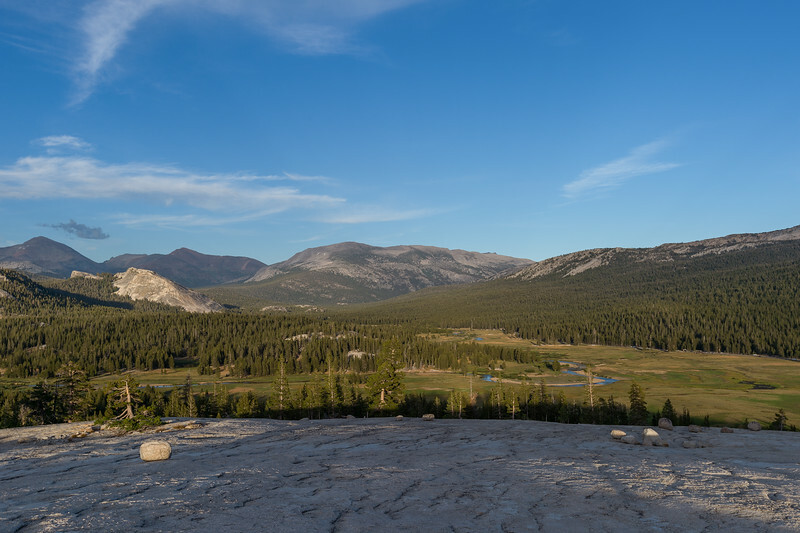 Tuolumne Meadows from the top of Potluck Dome. That's Lembert Dome straight across at left and I believe the two peaks behind Lembert are Mt. Dana (left) and Mt. Gibbs. The Kuna Crest is in the middle of the photo, rising above Lyell Canyon. Tioga Road runs along the edge of the forest on the right side of the screen. Please click above to see larger. Unicorn Peak in Yosemite. Yes, folks climb it -- I believe the approach is from the other side. Look at the larger version. Incredible how fractured the rock is. A tree on Potluck Dome. Not sure which I prefer, the black and white or color version (each with slightly different crops). My partner says the B/W is better. 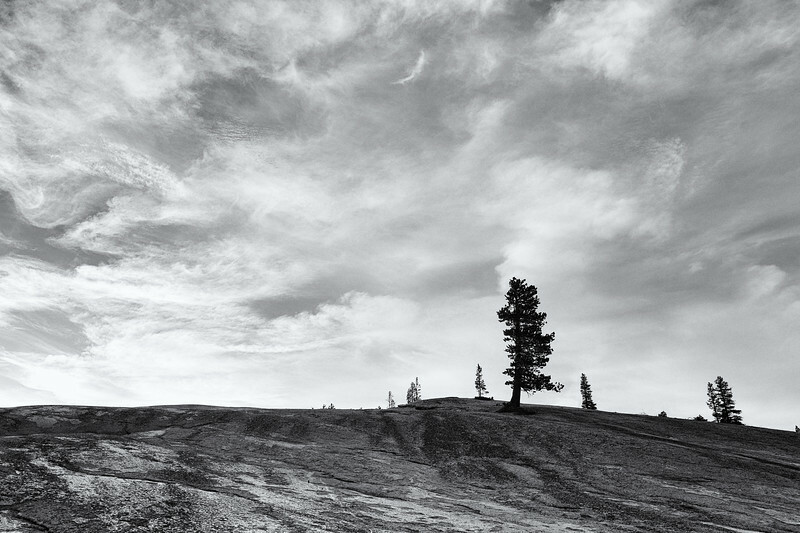 Another view of Tuolumne Meadows, this time in black and white. Interesting, but the color one above is better. 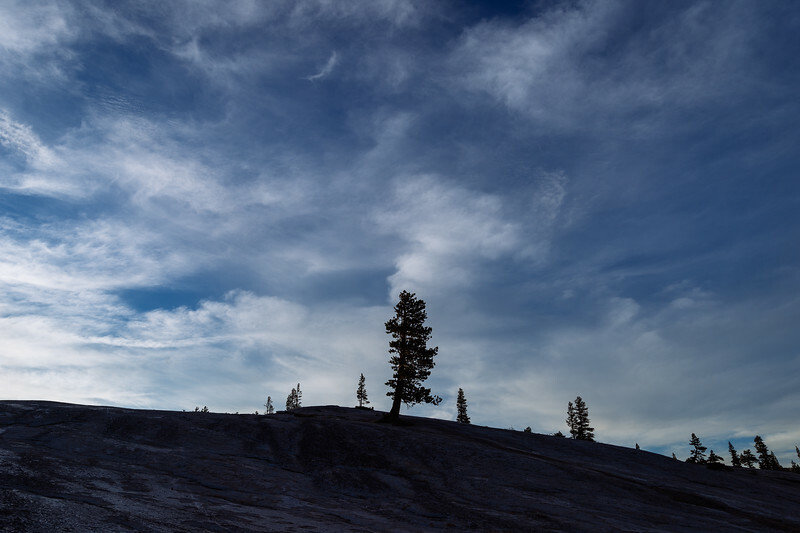 Another stab at a trees-on-a-dome photo. I've driven by and/or hiked past Potluck Dome many times over the years but had never bothered to walk to the top. Dumb. And it's a pretty easy walk -- about 20 minutes from the trailhead parking for Potluck Dome. 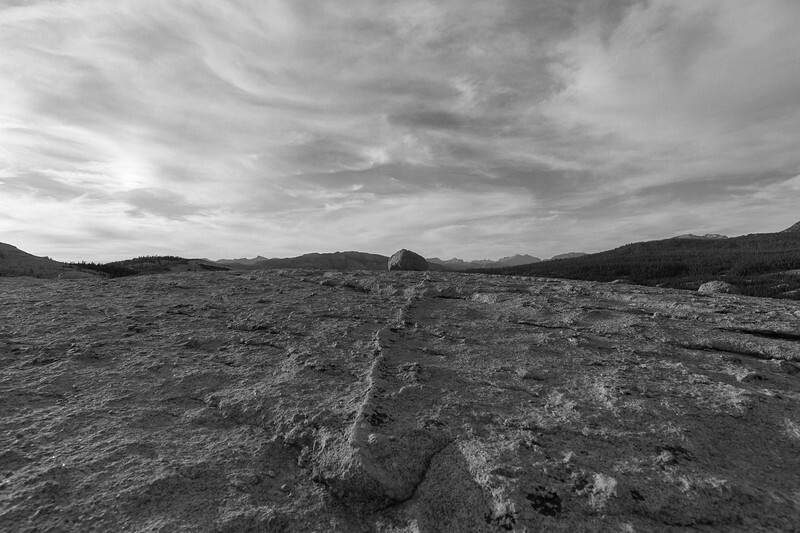 Take the trail around the meadow and then hop onto the dome and walk straight up the nice, grippy granite. 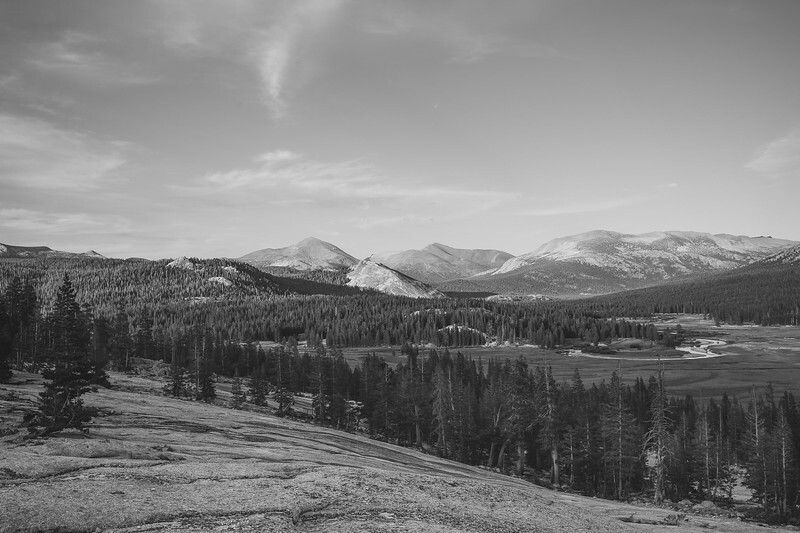 The top photo is probably my favorite for the view afforded of Tuolumne Meadows. There's nothing artistic or terribly special about it -- I just put the wide angle lens on the camera and went for the big view of one of my all-time favorite places. It's really a photo that demands to be viewed and printed at large sizes to enjoy. I also like the Unicorn Peak photo. 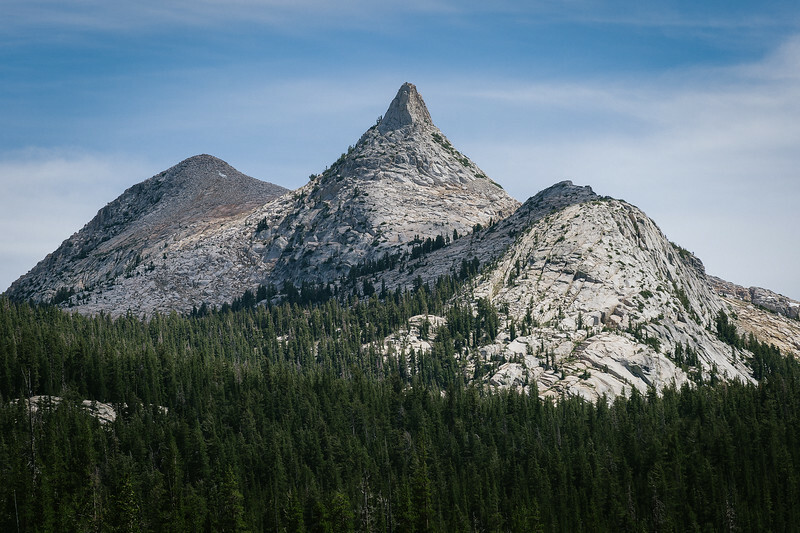 There's a ton of detail in the photo -- you can really appreciate what a big rubble of rock these peaks are, even if from a distance they take on quite elegant shapes. My beef with the photo is that it looks a tad digital despite several tries at making it appear a little more analog. Please check out my main photo site for more pics, info on buying prints and licensing. 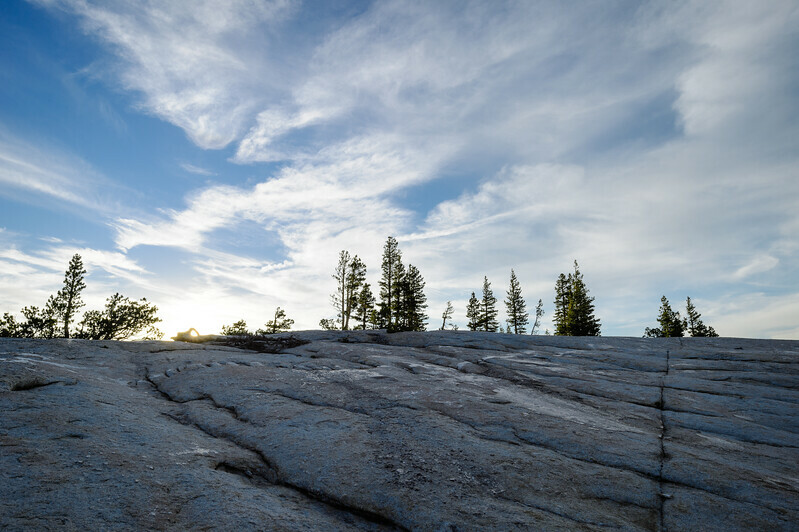 Here are three other posts from my recent 2.5-day Yosemite sojourn: dayhike to Glen Aulin, kayaking Lake Mary in Mammoth Lakes and visiting the Gaylor Lakes. The above photos are ©Steve Hymon and may not be used or reproduced elsewhere without my advanced written permission. All rights reserved.